DGL ULTRA German Chocolate / 90 chew tabs - Nature's Way®. 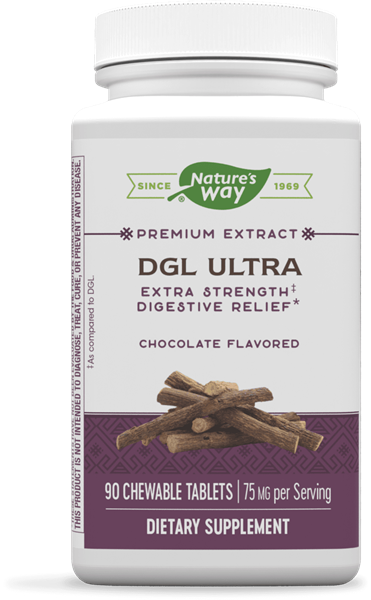 Deglycyrrhizinated licorice extract, formulated with Gut Guard™ for soothing digestive relief. * At Nature’s Way®, we believe nature knows best. That’s why our mission is to seek out the best herbs the earth has to give. It’s the way we deliver uncompromising quality and help you live healthier. Chew 1 tablet after food in the morning. Chew 1 tablet after food in the evening. If you are pregnant, nursing, or taking any medications, consult a healthcare professional before use. How does DGL Ultra work? What types of sugars are used in DGL Ultra? DGL Ultra contain small amounts of fructose and mannitol to enhance the flavor of the chewable tablet. These natural sugars are derived from plant sources. DGL is also available in a Fructose Free formula.